Need to build audience right now? We can help. If you're looking to publish smart, focused content that moves target audiences in productive directions, but you're not crazy about the hassles, cost, and uncertainty of hiring creative staffers, welcome to Teamstreaming. Whether you're a startup, a traditional publisher, or an advertiser, we'll help you put together the perfect freelance dream team, flow it seamlessly into your enterprise in real time, and conquer your objectives. It's an alternative to the messy, expensive business of hiring AND to the messy, expensive business of keeping full-service agencies on the roster. When you know what needs to get done, and you just want to bring in the team to do it and then get lost—that's us. 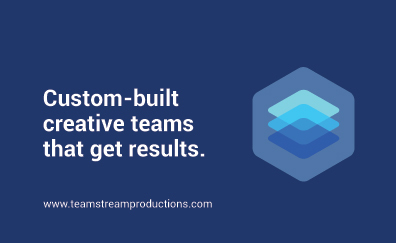 We call this Teamstreaming, and we've been assembling custom-built creative teams that get results for big companies for a couple of years now. We've launched bookstand webazines for Bauer Publishing, a website and email/eCRM program for McRae Capital Management, a blog for Nationwide Insurance, custom-publishing for Time, Inc. and their advertising partners, sales-team videos for Informatica, custom videos for the Taunton Press, press events for Kuma Games, online data sheets for Okta, and more than three hundred adorable puppy and kitten articles, slideshows, and videos for PetSmart. And a whole lot more. • We have a "lay of the land" meeting, and work quickly to understand your business and communications goals thoroughly. • Teamstream carefully defines the job to be done, and presents that quickly back to you in a two- or three-page document, including timing and dollars, for review. • On project approval, we bring our deep relationships across the global content community to bear and assemble exactly the custom team to get the job done right. • We handle as much or as little as you require, from conception to production to deployment to promotion, and monitor the metrics to make sure it all works. • We can manage continued content production on an ongoing basis, or hand over assets and train your team to manage it yourselves, at your option. If you have target audiences you need to deeply engage with targeted content that works hard toward your business objectives, let's talk—this is all that we do. You can email CEO Keith Blanchard directly, or feel free to take a look around first; you'll find details of our methodology or our services, look at some client work and other goodies. Looking forward to solving your content challenges together!